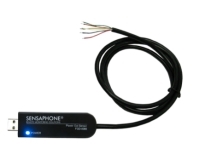 The magnetic reed switch may be used with all Sensaphone models to detect any unauthorized entry or intrusion. 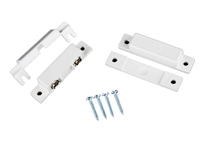 They are usually installed on doors and windows to detect their opening and closing. Several magnetic reed switches may be wired in series. Sensor Detects the presence of water on the floor. Works with all Sensaphone products. Comes with 25 feet of wire. 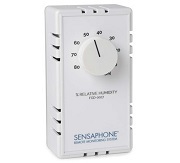 The Humidistat can be used with all Sensaphone models to detect a high or low humidity level. The device will cause your Sensaphone to activate an alarm when the humidity level reaches a set threshold. Made from high impact plastic with a brushed goldtone dial plate and a beige cover. A nylon sensing element provides long life and accurate humidity control. With a range of 10% to 60% RH level, the sensor causes an alarm when the humidity exceeds or falls below the set limit. Multiple sensors may be wired to a single input. For use in detecting the presence of water on a floor or in a false ceiling. Comes with 10’ of WaterRope cable to cover a larger area than the FGD-0013 water sensor. Up to three WaterRopes can be cascaded from a single sensor for even greater coverage. Works with all Sensaphone products. Comes with 25 feet of wire. 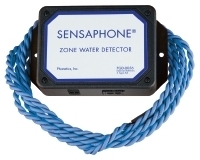 The Sensaphone FGD-0085 Power Out Sensor is a compact power outage monitoring device to detect power failures. Easily plugs into any 100-240V AC receptacle outlet for operation. Comes with 1 meter of wire with dual relay output. 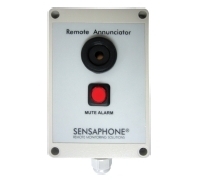 The Sensaphone FGD-0088 Remote Annunciator is a 12-24 Volt 90 decibel alarm buzzer in an enclosure. It can be used in conjunction with many other devices as a local alarm or as a remote alarm. This provides flexible monitoring via audible and visual alert whenever an alarm exists. Designed to monitor air temperature in a clean, indoor, environment. Sensing range depends on product. Check back page for Sensaphone product compatibility. Does not come with wire. The FGD-0107 is ideal for cold storage temperature monitoring. The glass bead filled vial will buffer any momentary fluctuations that may cause a preliminary alarm dial out, such as defrost cycles, opening of doors, and fans circulating air. The glass beads will slow the response time of the sensor allowing normal daily operations to occur without having an alarm initiated. This is a highly recommended sensor for every cold storage application. The Sensaphone FGD-0108 Dual Sensor is a compact and user friendly temperature and humidity sensor. It measures and displays both ambient temperature and relative humidity at the same time. All configuration is stored in the system’s non-volatile memory. Two Normally Open (NO) solid state outputs are available. 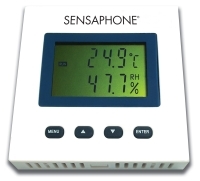 The Sensaphone FGD-0109 Dual Sensor is a compact and user friendly temperature and humidity sensor. It measures and displays both ambient temperature and relative humidity at the same time. Two 4-20mA analog outputs are available. The Local Temperature Display can be used with all Sensaphone 2.8k type temperature sensors. This provides an at-a-glance reading of the current temperature as well as the programmed minimum and maximum temperatures. The display is ideal for any location where onsite staff need a quick, convenient visual reading of the sensor, saving them the time of checking the monitoring system's data. When paired with a Sentinel Monitoring System, this temperature sensor with display helps VFC participants comply with requirements to safely monitor their refrigerator. The min/max values and current temperature are displayed and an audible alarm alerts local staff when temperatures fall out of the programmed limits. Choose between a NIST certified temperature sensor in a glass bead vial or glycol bottle. The electronic vibration sensor monitors the overall vibration condition of machines and equipment according to DIN ISO 10816. The sensor measures vibration velocity on a non-rotating component surface. The characteristic value is provided as a current signal (4-20 mA) for connection to the Sensaphone. The Sensaphone triggers an alarm when an out of limit value is exceeded. Requires a 24VDC power supply (FGD-0070).